A new test to help people with chronic abdominal symptoms determine whether the pain is IBS has been launched. IBSscreen, which aims to be as quick and as convenient as a pregnancy test, allows people suffering with chronic abdominal pain to test the symptoms in their own home. The test should take less than 10 minutes and comes with a questionnaire (available at http://www.IBSscreen.co.uk or in each pack) that informs the sufferer what steps may be needed to effectively manage the symptoms. IBSscreen is as accurate as the tests for IBD run in hospital and the test is already in use by some NHS Clinical Commissioning Groups. Therefore, the user can have confidence in the result. The development of the tool follows on from recent research that found 80% of people with IBS feel some anxiety about their condition, with 52% 'very' or 'extremely' anxious about it. The survey, of 219 people who treat themselves for IBS, also found that the large majority (78%) of GPs are sympathetic to the plight of their IBS patients. One of the main concerns is that often patients may require anything up to 5 visits to the GP before the condition is identified, especially considering the similarity of symptoms to conditions such as Crohn's Disease or colitis. The findings of this research led Ferring UK to launch IBSscreen. It works by detecting calprotectin, a chemical found in stool samples and which is only present when there is inflammation in the gut. Its presence means that you could have a condition like Inflammatory Bowel Disease (e.g. Crohn's disease or ulcerative colitis), whilst its absence - which is 50 times more likely numerically in the UK population - means that you might have a 'functional' bowel disorder such as IBS or chronic constipation. Dr Nick Read, Chair of Trustees and Medical Adviser of The IBS Network, said: "With this test, people can be reassured that they don't have chronic inflammation of the bowels." Irritable Bowel Syndrome affects nearly 10-20% of the UK population - between 6 and 13 million people in all. It usually presents as pain in the abdomen and bloating. 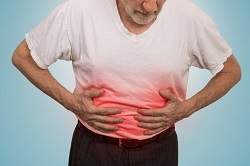 Other symptoms include altered bowel habit (alternating constipation and diarrhoea), gas and abdominal cramps. It is also associated with other symptoms such as lethargy, headaches and urinary frequency. So, IBS can affect the whole person, not just the gut. In addition, 50-60% of people with IBS can frequently suffer from anxiety and depression. Although this has not been shown to worsen the perception of the pain, it is an additional strain on the sufferer. Dr Read said: "Many IBS patients suffer in silence with their condition. This can cause feelings of isolation which will deepen their distress." IBS itself is not life-threatening - even though it is a legitimate disorder as opposed to being 'nothing wrong'- and having the condition does not mean that it will lead to anything more serious. The symptoms are caused when the muscles in the gut spasm at the wrong time and this manifests itself as acute, excruciating pain. There are numerous treatments available for IBS, many of which are available on prescription including laxatives, fibre or bulking agents and antispasmodic drugs. In addition, sufferers can find relief through changes in diet as well as other techniques such as relaxation therapy to reduce stress.